Mark your spot with these unique bookmarks and a special shape of your own. These bookmarks feature a full color imprint of your organization's logo and message and a unique seeded paper shape attached! Plant the seeded mint green paper to grow an herb of your choice in your garden or yard. 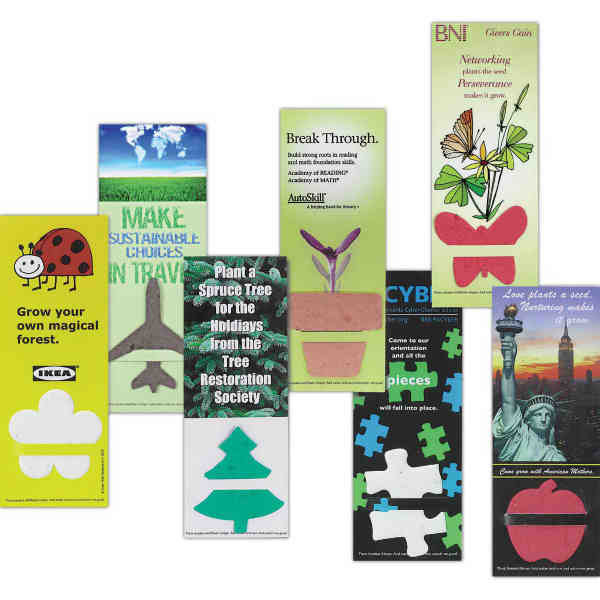 A great promotional product these bookmark's seeded papers come in a variety of over 45 seeded paper shapes. Our mixed herb seeds includes a mix of Basil, Chive and Parsley seeds. Size: 2 1/4 " x 6 "
Price Includes:Full color, one side imprint.